Ohio's House District 12 is still too close for most news agencies to call (thanks to outstanding provisional ballots), but the Republican candidate (who leads by less than one percentage point) looks to be the likely winner. Regardless of which candidate wins, the same two candidates will face off again in November. Many Democrats had their heart set on winning that race, and the loss was disappointing. But they should also be encouraged by the result. They came within 1 point of taking a district that was rated a +14 for Republicans -- and which Trump had carried by 11 points in 2016. It continues a trend that has happened since 2016 that has Democrats cutting sharply into Republican advantages. That is illustrated in the chart above (from fivethirtyeight.com). 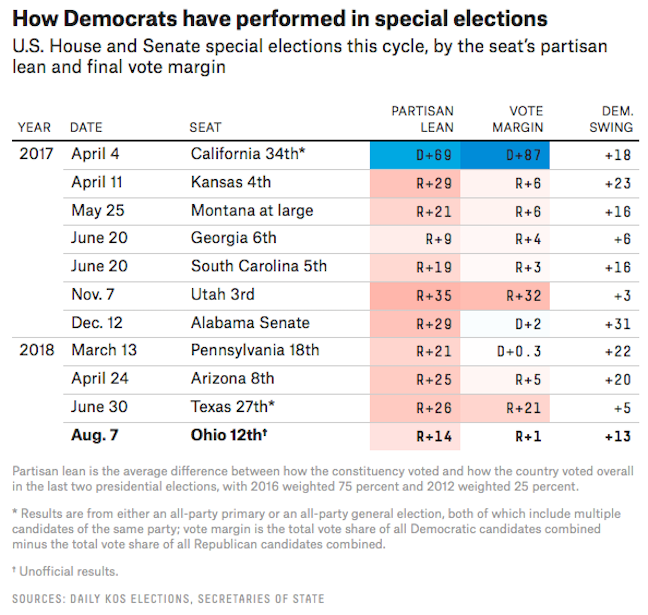 It shows that in the races so far, Democrats have seen a shift of between 3 and 23 points in their favorite. The average shift toward Democrats is 16 points. The Democrats currently have 193 seats in the House of Representatives. They would need 218 seats to take over the House -- an increase of 25 seats. Can it be done? The Cook Political Report has 34 House Republican seats that either lean toward Democrats or are rated as toss-ups, and another 26 seats that only lean toward Republicans. That's 60 seats that are competitive. Sabato's Crystal Ball has 11 Republican seats that now lean Democratic, and another 32 GOP seats that are toss-ups. Another 15 seats are rated as only leaning toward Republicans. That's 58 seats that could be won by Democrats, especially if the national shift toward Democrats holds true. Democrats are unlikely to win all of those seats -- but they don't have to do that. If they win just half of the 58 to 60 seats, they will take control of the House. With Democratic enthusiasm at a high right now, and likely to be in November, the Democrats should be able to do that. The one warning I would give is -- Democrats cannot assume they are going to win and stay at home on election day. They must show up at the polls -- and do so in large numbers. If they do, this could be a very good year for Democrats.